Altitude : 2725 ft above sea level. Agumbe is a tiny hillstation tucked away in the heart of the Karnataka Western Ghats. A contiguous reserve forest borders the Someshwara wildlife sanctuary and the Kudremukha wildlife sanctuary, it is a perfect place for those who needs peace with nature. It lies in the Thirthahalli taluk and the Malnad region of Shimoga district, at a height of 2725 ft above sea level. Surrounded by rich bio diversity, this little hamlet is popularly referred as the Cherrapunji of the south. 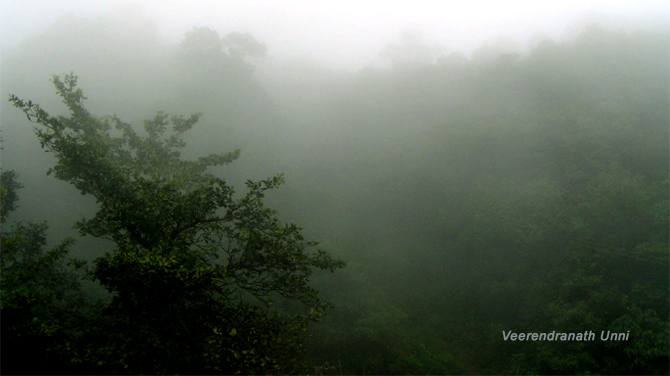 The wettest region in Karnataka, Agumbe, with a mean average rainfall of 7000 – 8000mm, is credited as the second highest in India after Cherrapunji. Natural scenic beauty, verdant valleys and streams, picturesque mountain terrains etc have made Agumbe a very famous location for holidays. One of the highest peaks of Western Ghats, Agumbe offers glorious sunset (considered to be the one of the most beautiful sunset in Karnataka). Travellers on the highway from Shimoga to Udupi or Mangalore, inevitably stop here to enjoy this sunset. It is also a trekker's paradise and a number of trekking trails are available here. The Agumbe to Emkalkere, Agumbe-Kudluthirtha-Seethanadi and Agumbe-Norshimha parvatha-Kigo are some of the interesting treks. The density of forests, the topography of the area and the suitable weather condition have all made Agumbe as a hotspot for the longest venomous snake in the world, the King Cobra aka Hamadryad. The renowned herpetologist, Romulus Whitaker called Agumbe as the capital of King Cobra. It also hosts Agumbe Rainforest Research Station (ARRS), the only permanent rainforest research station in India. 'Malgudi Days', the famous T.V Serial based on R.K.Narayan's Novel was shot here. The ‘Doddamane’ (Big House) a 150 years old house where the series was filmed still maintains its beauty and hosts visitors every day. Run by Kastur Akka, it is the best accommodation option available at Agumbe with all traditional rituals and cuisine. It situated just a short walk from the Agumbe bus stand. Opens : 5 AM to 10 PM. For booking Contact : Kastur Akka : 08181-233075 or Ravikumar Pai (Her son in law) : 9448603343. Agumbe has a sunset point, that attracts a lots of tourists. A gallery has been erected at the edge of ghat for the purpose of viewing the sunset. Falls at a height of 850 feet, it is the 11th highest waterfall in India. Located amidst the thick and dense forest areas of the Western Ghats, the falls together with the adjoining Barkana valley, makes a panoramic view. The Seeta River originating at Narasimha Parvatha flows through the region forms this waterfall .The name Barkana is derived from 'Barka', the mouse deer and 'kana', meaning home. To enjoy its beauty, one has to reach Mallandur village which is at a distance of 8 Kms from Agumbe and a 3 km trek through mountain trails from Mallandur to reach Barkana view point. It is also one of the best trekking routes. From here one can enjoy the panoramic view of the valley beneath. A Rickshaw can be hired to reach Mallandur. Note: Try to arrange a local guide because the jungle is dense. A favorite picnic spots among the locals, Jogi Gundi is located amidst in the deep jungles. It is just 4 km from Agumbe, on the way to the Barkana Falls. Here, river Malaprahaari, falls from a 25 feet height. Jogi Gundi derives its name after a saint (Jogi) who used to meditate inside the cave near the falls. The falls can be reached in a 15 minute narrow and steep trail trek. The best time to visit this fall is during the monsoon. It is charming waterfall on the way to Hosanagara near Aralsuruli. The river Sharavathi takes a spectacular leap from a height of 7mts. It is just four kms away from the Shivalinga.The best time to visit this fall is during the monsoon. It is a beautiful waterfall just 20 km from Agumbe. Formed by the Seeta River, it falls from a height of 300 ft into a gorge forming a beautiful sight. One needs a trek of 3 to 4 km to reach here. The best time to visit this fall is during the monsoon. It also considered as a holy spot. The Manga Theertha (Monkey Falls), is situated very near to this falls. It is a 14th century temple which exhibits Hoysala Art is a major tourist attraction. Located in the forest area of Agumbe, it is the only permanent rainforest research station in India. It was established by the herpetologist, Romulus Whitaker, in 2005. Accommodation facility is available and one can stay in tents or cottages here. For this, advance booking is needed. They serves simple vegetarian food and also organises treks inside the forest. Non-vegetarian food is prepared on advance request. The station also has a micro hydroelectric unit that helps in maintaining its eco-friendly policy and operates on solar power. Timings: 9:00 am To 6:30 pm.